Here is "TOP" No. 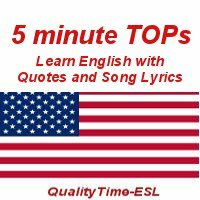 12 to help you understand spoken English through "Training with Oral Practice" based on quotes and song lyrics. Click on the icon below to get the recording or go to the iTunes store to subscribe and just type "Marianne Raynaud" in the search window. Below we tell you where the lyrics come from, but do the exercises first! If you want to go on, TOP 13 is now available. You can also consult our complete list of TOP episodes.